As several commentators have noted, the recent protests in Iran have included criticism of the regime’s foreign policy priorities. One of the BBC’s early reports – published on December 29th; the day after the protests commenced – also noted those chants. “There is also anger at Iran’s interventions abroad. In Mashhad, some chanted “not Gaza, not Lebanon, my life for Iran”, a reference to what protesters say is the administration’s focus on foreign rather than domestic issues. However, when the BBC later began producing backgrounders on the protests in Iran, that issue was downplayed. BBC audiences were not however informed what that “involvement” entails or how much it costs the Iranian people. In a written backgrounder also produced by Rana Rahimpour and published on the BBC News website on the same day under the headline “Iran protests pose an unpredictable challenge for authorities“, readers found the same statement. “When the protests started last Thursday, they were about the current economic crisis but as they spread, pent-up frustrations spilled out and politics became a big part of them. President Rouhani has been widely criticised. He has disappointed voters who hoped he would do more to turn round an economy that has been damaged by years of sanctions, corruption and mismanagement. Another backgrounder – published on the BBC News website on January 4th under the headline “Six charts that explain the Iran protests” made no mention whatsoever of the vast sums of money shoring up the Iranian regime’s protégés and proxies around the Middle East. Two and a half years ago senior BBC journalists covering the P5+1 deal with Iran assured BBC audiences that the vast sums of money freed up by sanctions relief under the terms of the JCPOA would be used by the Iranian regime to improve the country’s economy. Since then, the BBC has continued the existing practice of serially avoiding any serious reporting on the issue of Iran’s financing of terror groups and militias across the Middle East. Given that long-standing policy of omission, it is obvious that BBC audiences are not sufficiently informed on the issue to be able to understand the full significance of those euphemistic references to “Iran’s involvement in countries like Lebanon and Syria”, its “role in conflicts across the Middle East” and its “expensive foreign policy” found in content supposedly meant to explain why Iranians have taken to the streets in protest. Predictably, the BBC News website’s extensive coverage of the May 19th presidential election in Iran included copious portrayal of the winning candidate Hassan Rouhani as a “moderate” and a “reformer”. “Early on in the campaign the incumbent, President Hassan Rouhani, posted a photo of himself on social media which caused a flurry of comment. He was out on a weekend walk in the mountains standing next to two young female hikers, both of whose hijab is far from what would be considered proper by the hardliners. It was a clear message to young, modern female voters, that he was the candidate who was not overly bothered about the country’s restrictive dress code and other curbs on social freedom. Mr Rouhani’s campaign video makes a point of praising Iranian women’s achievements in the worlds of both work and sport, and offering his support. “…supporters of President Rouhani who back his promises to steer the country toward moderation came out in big numbers too. […] This was a revenge of the people against the hardliners who intimidated them, jailed them, executed them, drove them to exile, pushed them out of their jobs, and discriminated against women. “Friday’s vote in Iran was the revenge of the moderates. A rejection of those who had intimidated them, jailed them, executed them, drove them to exile, pushed them out of their jobs. BBC audiences are of course no strangers to that good cop/bad cop portrayal of Iranian politics. Ever since Rouhani was first elected in 2013, the corporation has been portraying him as a “moderate” and a “reformist”, while ignoring the fact that the United Nations Special Rapporteur on the situation of human rights in the Islamic Republic of Iran, Ahmed Shaheed, published a report in 2015 that found – among other things – that the number of executions in Iran has risen under Rouhani’s presidency. Last year Amnesty International reported similar findings. “Witness the latest repression targeting the mullahs’ usual suspects. Tehran’s Prosecutor-General on Sunday announced it had sentenced a couple to death because they had founded a new “cult.” The announcement was short on details, but the charges could mean anything from running a New Age yoga studio to a political-discussion club. Historic Christian communities such as Assyrians and Armenians are afforded second-class protection under Iranian law, while apostasy by Muslims is punishable by death. Despite some early rhetoric about tolerance, Mr. Rouhani has been unwilling or unable to improve conditions for religious minorities. “During his campaign, he [Rouhani] told voters that he would be a “lawyer” defending their rights. He criticized his main rival, Ebrahim Raisi, for his role in ordering the executions of political dissidents. He promised gender equality and a freer press. All of that sounds pretty good. And for those in the west looking for an Iranian version of Mikhail Gorbachev, it makes a nice talking point. Unfortunately, there is no reason to believe Rouhani will deliver, or even try to deliver, on any of these promises. And yet, the BBC continues to spoon-feed its audiences with simplistic framing of Rouhani as a benevolent “moderate” and “reformer”. One would of course expect that a media organisation obliged to provide its funding public with accurate and impartial information with the aim of enhancing their “understanding of international issues” could do considerably better. The BBC News website published numerous reports concerning the death of Akbar Hashemi Rafsanjani on January 8th and a common feature in all that content was the promotion of the notion that Rafsanjani was a ‘moderate’ and a ‘reformer’. “But over the decades, the wily politician who held almost every major position in government became known for his pragmatic approach to Iran’s theocracy. He pushed for a greater rapprochement with the West and more social and economic freedoms. “Akbar Hashemi Rafsanjani was the original Mr. Moderation. Western observers saw the former Iranian president as a sort of Deng Xiaoping in clerical robes: a founder of the Islamic Republic who was destined to transform the country into a normal state. Rafsanjani, they thought, was too corrupt to be an ideologue. Khomeini’s death in 1989 occasioned Rafsanjani’s worst political misstep. Thinking he could puppeteer events behind the scenes, Rafsanjani successfully promoted his archrival, Ali Khamenei, as the next supreme leader. But Mr. Khamenei, far more assertive than Rafsanjani had imagined, soon consolidated power. The regime’s Western apologists framed that rivalry as a genuine ideological conflict between the “hard-line” Mr. Khamenei and the “pragmatic,” “moderate” Rafsanjani (along with others, such as current President Hassan Rouhani). President Obama’s nuclear deal was premised on the same fantasy: Rafsanjani had accumulated vast, ill-gotten wealth—here’s someone with whom we can do business. While the BBC is clearly not alone in having bought into the notion of ‘moderates’ and ‘reformists’ within the Iranian political establishment, one would of course expect that a media organisation obliged to provide its funding public with accurate and impartial information which will build their “understanding of international issues” could do considerably better. However, only those who followed the link and bothered to read the article – titled “BBC journalist Rana Rahimpour stopped from flying to US” – in full would appreciate that in fact the well promoted story (which is also told in an additional article by BBC Trending called “Why I tweeted a picture of myself in tears“) has nothing at all to do with the BBC or journalism and that it is actually about the visa related tribulations of a woman making a private journey who just happens to work for the corporation. The question of whether or not journalists should become the story is of course largely a matter of taste but in this case it seems pretty clear that Ms Rahimpour’s BBC connections prompted wide coverage of an event which might otherwise have received much less exposure. Interestingly, a previous story about another BBC employee did not receive any coverage from the corporation. BBC News producer Erica Chernofsky wrote about her experiences whilst driving in Judea & Samaria last October at the Times of Israel. “And then suddenly there was a loud boom. And another, and another, and then another. And I couldn’t see a thing, and I heard my children screaming, the baby crying, I looked out my window and saw the Palestinian children, and then an Israeli soldier. I fumbled for my cell phone, following the protocol I had been taught but never had to use. I called for help. I heard my voice shaking as I tried to explain where we were, what had happened, and as I did my car’s windscreen finally came into focus, it was smashed, my legs and arms were covered in glass, my knee was burning where a shard of glass was stuck inside my skin. And then I dropped the phone, suddenly remembering my children, ohmigod my children, the baby! I climbed out of my seat to look behind me as my husband continued driving away as fast as he could. So, whilst a BBC employee with nationality-related visa problems makes the news, a BBC employee targeted in a terror attack for no other reason than her nationality did not. “Islamic Republic of Iran Broadcasting (IRIB) has released details of a private meeting between Iran’s top nuclear negotiator and IRIB directors about the July 14 nuclear deal in Vienna. The meeting, which was off the record, took place at the end of July. 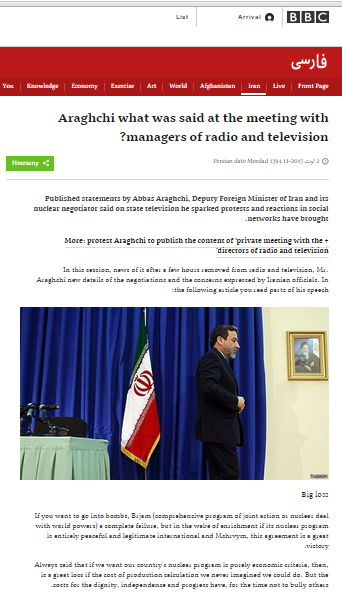 On Saturday, August 1, the IRIB news site published the comments without the permission of Abbas Araghchi, Iran’s chief negotiator. Abbas responded immediately, saying the publication of the private conversation was “contrary to national interests and security” and “incompatible with professional ethics.” He also said that the published text contained numerous errors. Curiously though, the BBC apparently did not consider that admission by an official of a UN member state that it is systematically breaching the terms of UN SC resolution 1701 (“no sales or supply of arms and related material to Lebanon except as authorized by its Government”) worthy of translation into English for the benefit of the majority of members of its audience who do not read Farsi. 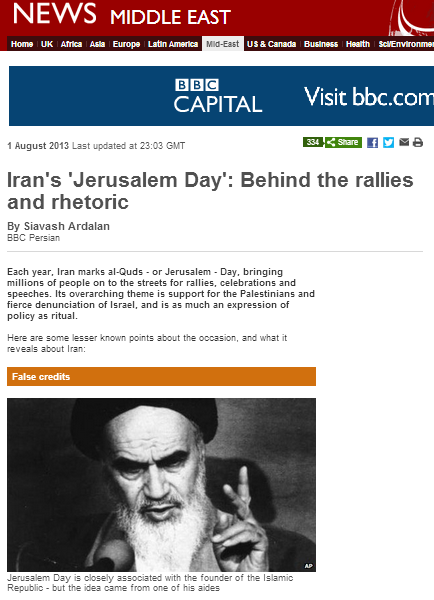 On August 1st 2013, the BBC News website published a ‘guide’ to Iran’s ‘Al Quds day’ events – held this year on the following day, August 2nd – on its Middle East page. The piece was written by Siavash Ardalan of the BBC Persian service. In fact, both in Iran and elsewhere, the overriding characteristic of this ‘happening’ is calls for Israel’s destruction and displays of support for terrorist organisations dedicated to that cause – especially Hizballah. That – by any conventional definition – is rather more than “fierce denunciation”. “Jerusalem Day rallies are a must for Iranian politicians. Any politician who hopes to establish their credentials has to be seen and hope to be heard delivering a tirade against Israel. It confirms their loyalties and reiterates their identification with what has become an unshakable tenet of Iran’s foreign policy. The official stance is that Israel is, as a matter of moral principle, illegitimate. However, it does not follow from this that Iran is under the obligation to take direct and pre-emptive action to destroy Israel. This will happen in due course, the rhetoric goes. Ardalan’s claim that Ahmadinejad’s Holocaust denial was kept in check on Al Quds day itself is purely cosmetic nit-picking considering that Iran held an International Holocaust Cartoon competition in 2006 and a Holocaust denial conference the same year, with subsequent similar events and a website of Holocaust cartoons launched in 2010. “The idea behind Jerusalem Day rallies was to gather all fasting Muslims every year on the last Friday of Ramadan to show their opposition to the existence of Israel. However, Jerusalem Day did not develop beyond an Iranian experience. Iranian leaders may have initially been motivated by the desire to further an anti-Israeli drive. However, the need to consolidate and project Iran’s leadership and influence in the Islamic world as well as intimidating opposition forces inside remained as an incentive to keep the tradition alive. Whilst it may indeed be the case that the attraction of Al Quds day is limited, Ardalan’s rather transparent attempt to play down the spread of the event to other countries and the involvement of non-Shiia and non-Muslim groups is all too obvious. In this year’s Al Quds day event in Berlin some 900 people took part. “Police officials told The Jerusalem Post that roughly 900 Islamists marched along the Kurfürstendamm shopping strip, calling for the abolition of the Jewish state. BBC audiences would not have found any mention of that event in the ‘Europe’ section of the BBC News website. Neither would they find any BBC coverage of the march – complete with racist placards – held in London on August 2nd, despite the fact that it commenced outside the BBC building in Portland Place. That rally was as usual organized by the Iranian regime-linked ‘Islamic Human Rights Commission’ – a registered charity whose chair, Massoud Shadjareh, has been quoted and promoted by the BBC on numerous occasions over the years. The event was also supported by various non-Shiia bodies and non-Muslim organisations such as the ‘Scottish Palestine Solidarity Campaign’, ‘Jews for Boycotting Israeli Goods’ – one of the founders of which, Tony Greenstein, has appeared on BBC programmes – and the ‘Stop the War Coalition’ – members of which are also to be found not infrequently as guests of the BBC. In contrast to the curious little local custom – odd, but harmless – which this BBC article tries to make Al Quds day out to be, it is in fact a well-organised, well-funded vehicle for promoting racist hatred and glorifying terrorism. BBC audiences are entitled to expect to read the truth about it rather than Ardalan’s insipid, almost anthropological, whitewash.